In a media environment where all images are apportioned to partisan arguments—unreasonable and unthinking—Susan Sontag’s mission to resume a more considered meditation on photography is a noble one. Chapter 7 of Regarding the Pain of Others, which briefly addresses her 1977 work, On Photography, is compelling reason to buy the book. Sontag’s recall on photographic history is staggering (although at times she provides more history than insight), and her give and take on the question of War photography is a stand against over-simplification. Sontag rejects the assumed arguments—that photographic documentation of tragedy/atrocity mobilizes conscience and change, or, conversely, that photographic documentation of tragedy/atrocity numbs the conscience, and undermines change. Even at her most convincing, however, Sontag’s own arguments are often disappointingly partial. Sontag never draws a clear distinction between media and photography, and throughout the work, her assessments waver in ever-shifting focus. While the effects of the image in a media polarity can be easily discerned—more ordnance in the perpetual war between the bellicose and the callow—Sontag’s model for the cause of that polarity remains fuzzy. Sontag’s distinction of the non-believability of “beauty” and “pathos,” as opposed to the apparent trustworthiness of “ugliness” and “horror,” might have provided another valuable exploration in these pages—as the removal of art from society is primary to a culture receptive to only the pre-supposed idea. Sontag’s decision not to include the photographs that she discusses is a similarly provocative, if undelineated decision. The immediate conclusion one extracts is that Sontag has more faith in the word than the photograph to evade spectacle. Still, one cannot help but wonder if the decision has something to do with “taste” (a code word, to Sontag, for censorship) or, more interestingly, copyright, a subject which, as heavily as it figures in any conversation about photography today, goes largely unengaged by Sontag. Much as she would remove political divisiveness from the image, Sontag makes some effort to avoid divisive politics. Still, the one-sidedness of defending a New York gallery exhibition of lynching photographs and postcards from the 1890s to the 1930s, while denigrating the Holocaust Museum, demonstrates the nature of her own double-standard—in terms of the justification of one race’s suffering over that of another, as well as the willingness to witness the horror of a people who don’t look like her. All of which, of course, is what she’s complaining the other side is guilty of. (Sontag is wrong to claim there are no United States Museums dedicated to the history of the slavery—there are several. I would join her, however, in a call to create a National Museum of Slavery, were one not already under construction in Fredericksburg, Virginia.) Sontag’s claim that “Europe today . . . has claimed the right to opt out of war-making,” is similarly narrow. Regardless of the rightness or wrongness of the French, German and Russian position on U.S. involvement in the Middle East, Europe’s decision to “opt out of war-making,” sadly but truly, has as much to do with personal profit as moral fortitude. The only thing that it seems “Europe” can be counted on to opt out of is taking responsibility for a historical pre-eminence of anti-Semitism and colonialism—the origins, by the way, of the mess we’re in. 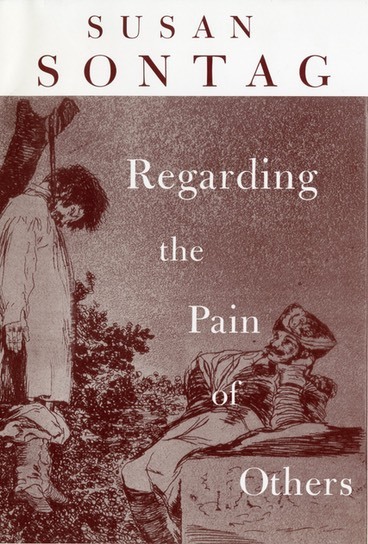 In her final conclusion—which to the credit of Regarding the Pain of Others, is not borne out by previous chapters—Sontag asserts that we cannot understand the pain of others. (As if anyone can fully “understand” anything about anyone else.) Not only does the idea promote the very silly notions that only people in far away countries suffer, and that only people in the First World can know happiness, but the apathy that results from helplessness. Sontag, in this, has failed to resist the mechanics of the media machine—this is her own over-simplification to sell books, and this is her own over-simplification that will make people mutter and give up.